Some of my favourite places in the world are pink. 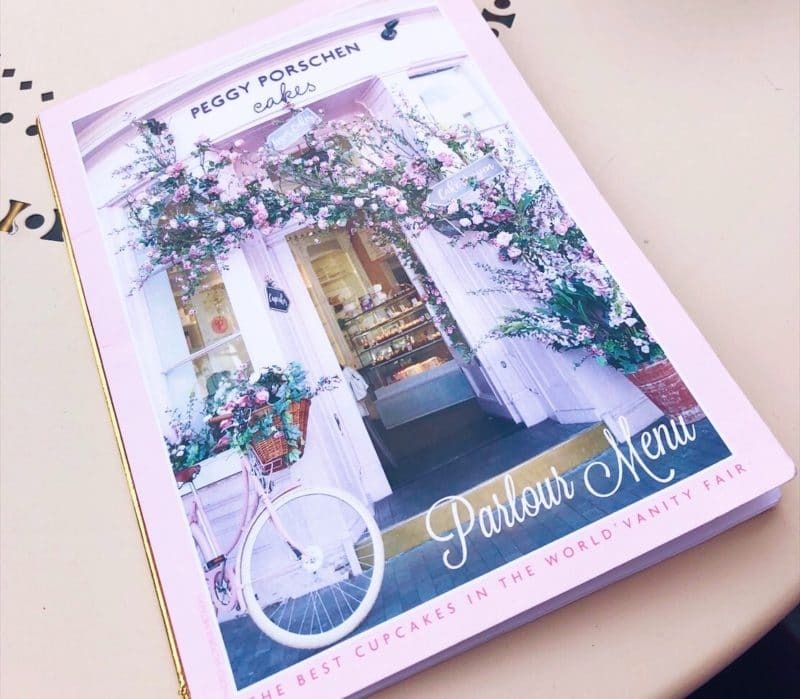 The Beverly Hills Hotel, the inside of Laduree at Easter, the gardens of Paris in spring, any Notting Hill side street, and a few I’m yet to visit including Sketch in London, the Paul Smith wall in LA and Pink Lake in Australia. 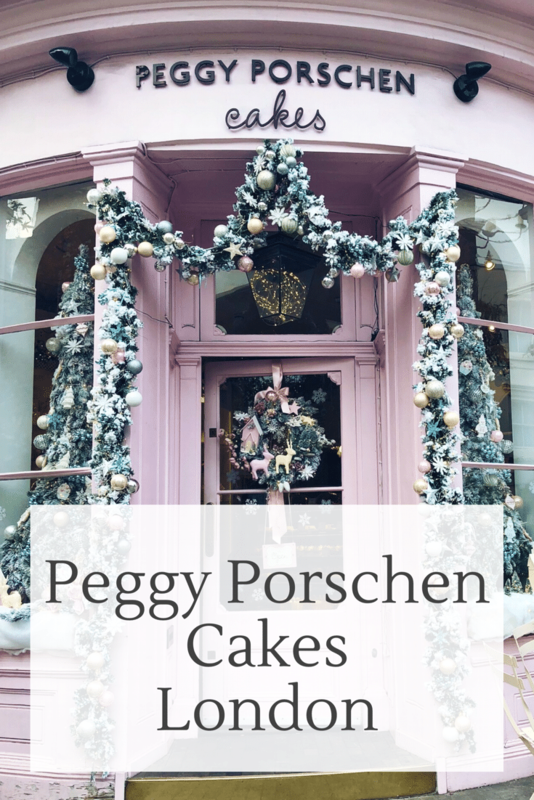 The latest pink establishment I had the absolute pleasure to visit was Peggy Porschen Cakes in London. 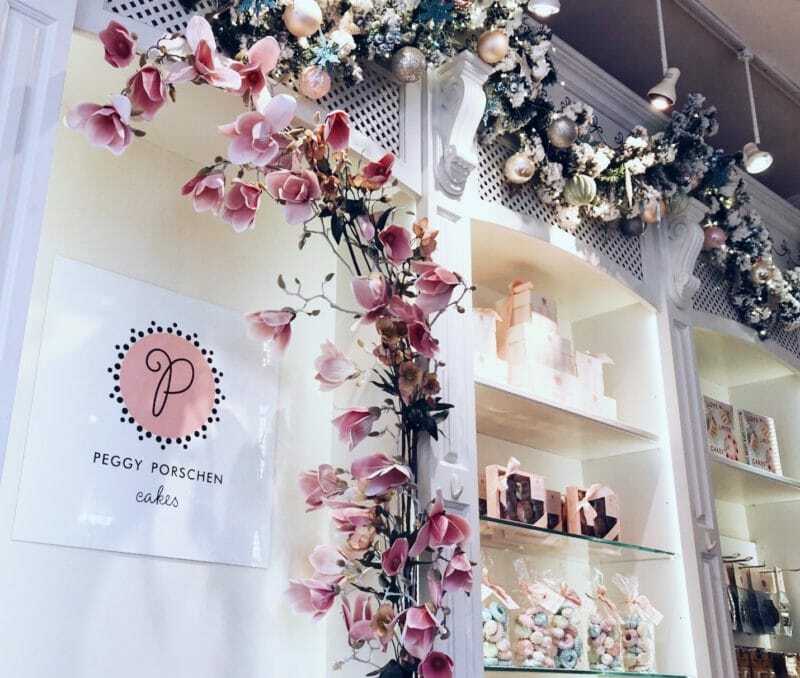 If you don’t straight away recognise the name ‘Peggy Porschen’ when you hear it you’re bound to recognise it when you see it. 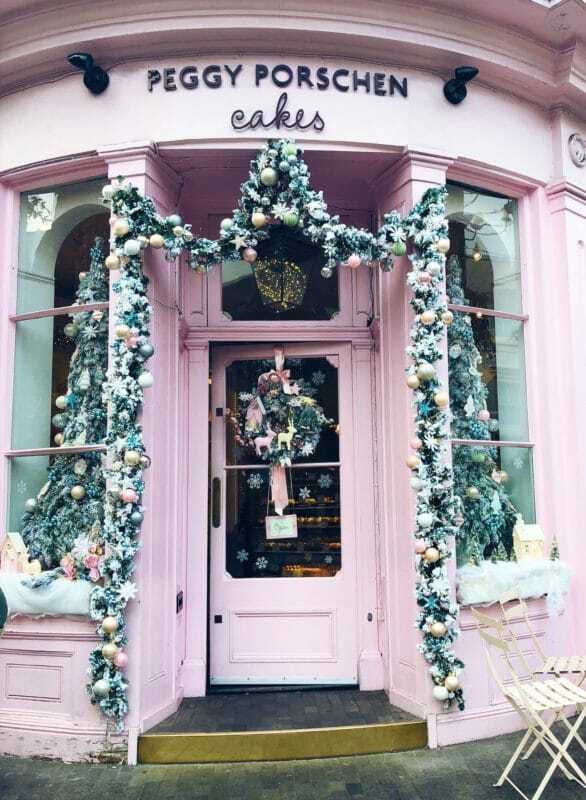 That fabulous pink doorway and explosion of flowers, as well as literally everything else being the same shade of powder pink make up the most photographed cake shop in the capital. 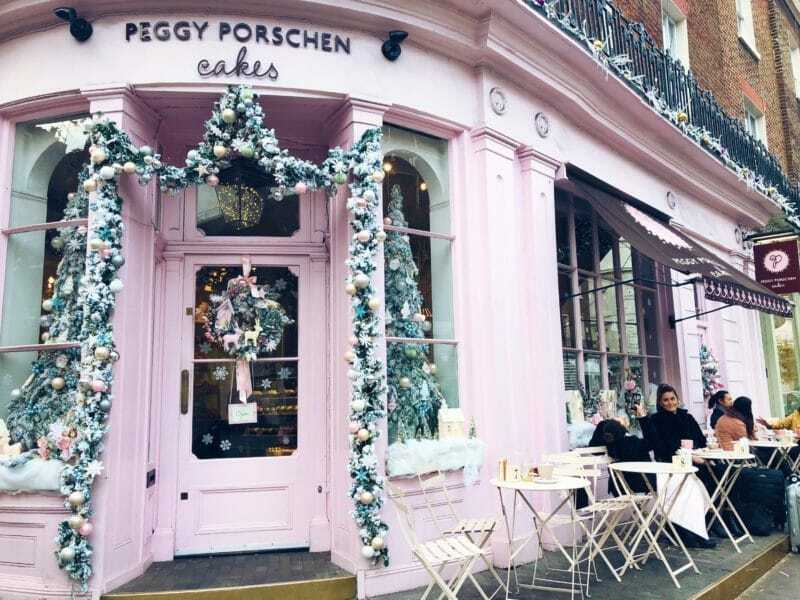 Peggy Porschen Cakes wraps itself around a London street corner, and well, you can’t really miss it. 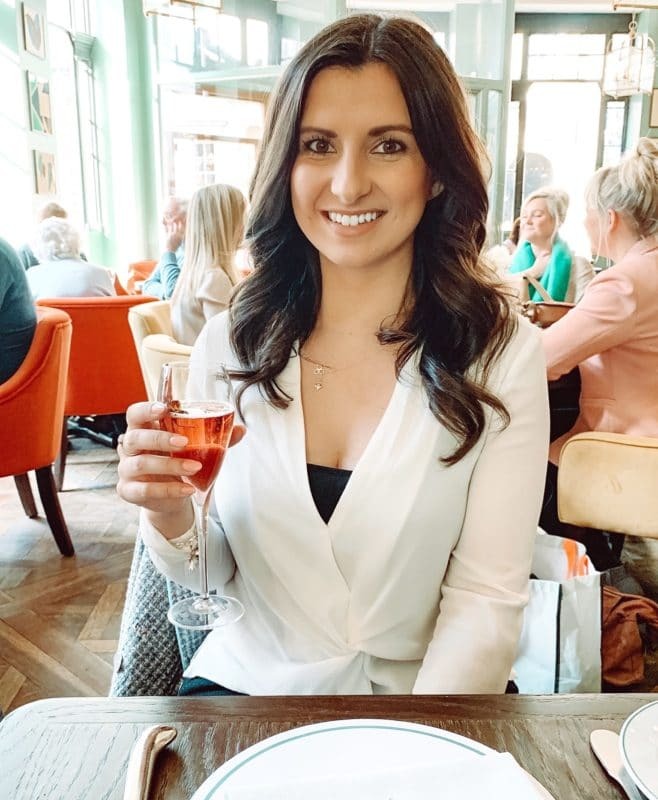 When we were trotting our way through London recently (two trips in one week, one for work, one for shopping…and cake), it appeared in front of us like a shining pink beacon calling us in and I had to stop and literally smell the roses. It’s quite surreal seeing it on a normal London street, but it wasn’t just me lured in by it’s pink charm. 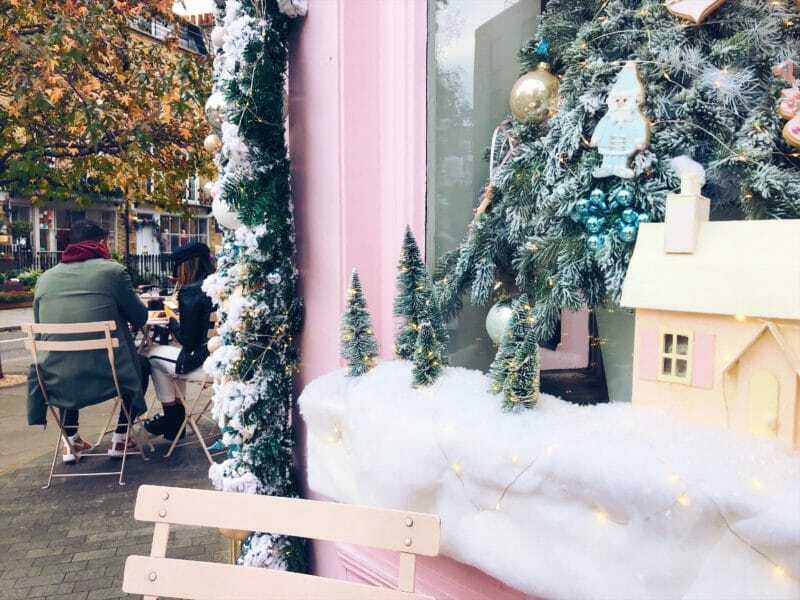 Friends and couples were huddled around it’s tiny pink outdoor tables carefully choosing their order, and I’m not going to lie, a fair few were taking full on photo shoots in the very Instagrammable doorway. I’ve never seen so many poses thrown out in the space of two minutes. We went inside, and were met with the most adorable little cafe atmosphere. 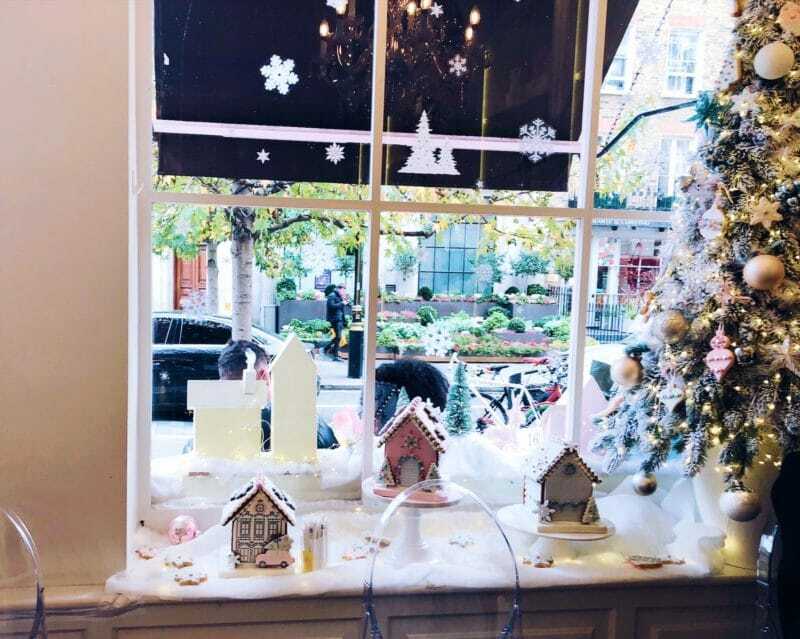 It’s very cosy, and a bit overwhelming, but once you’ve got used to the pink overload, you notice the stunning window displays, which at this time of year were actually full on Christmassy. I’ve never thought of pink as a Christmas colour, but I can’t see Peggy decorating her place any differently can you? The white shelves were stacked with cake recipe books, the art of icing decoration, cake chic and all manor of technical cookery encyclopaedias. 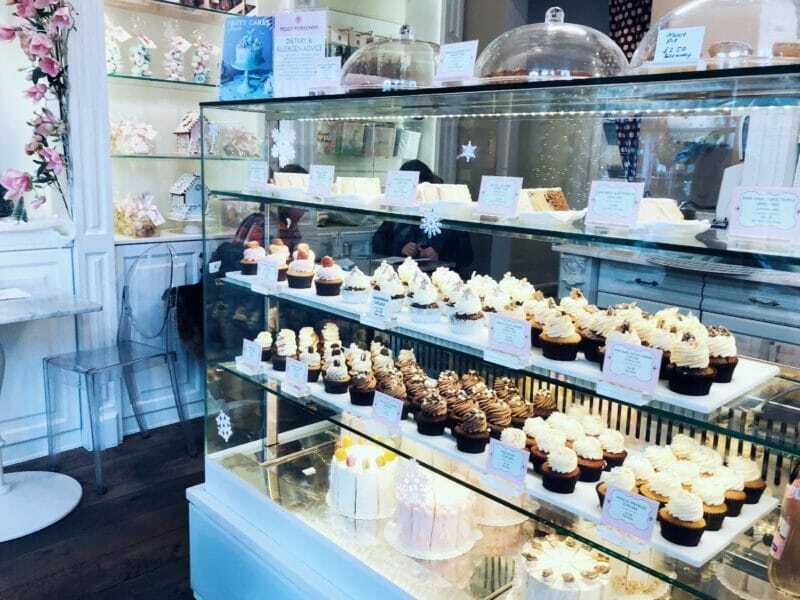 It was the cake cabinet that really caught my eye, and seeing the red velvet cupcake I decided we had to sit in rather than take it away. The waitress handed me a menu, and asked if we’d prefer a table inside or out. Not wanting to miss the model shoot still going on outside I decided people watching would be more fun from out there, so chose at a little pink table outside. We were given thick blankets for the cold too. I really wish we did more eating outside in this country even in the winter. 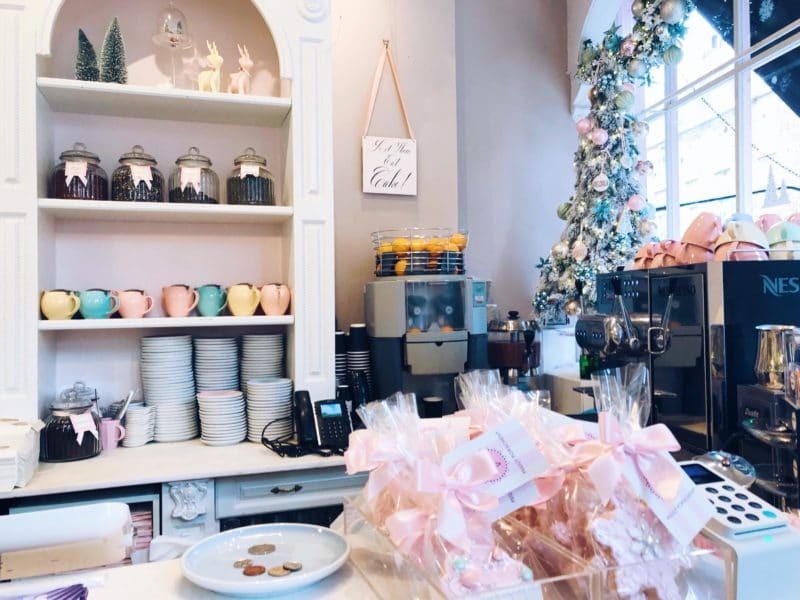 The menu was huge, with every mouth watering flavoured cake, cupcake and sweet treats you could think of, as well as a full range of hot drinks, teas and soft drinks. 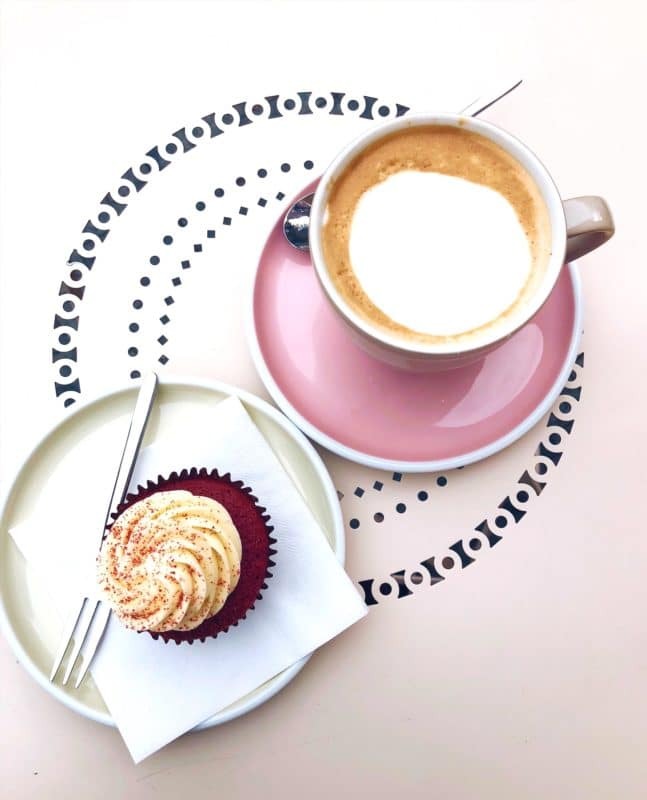 I went simple with a latte, a red velvet cupcake and an orange juice. 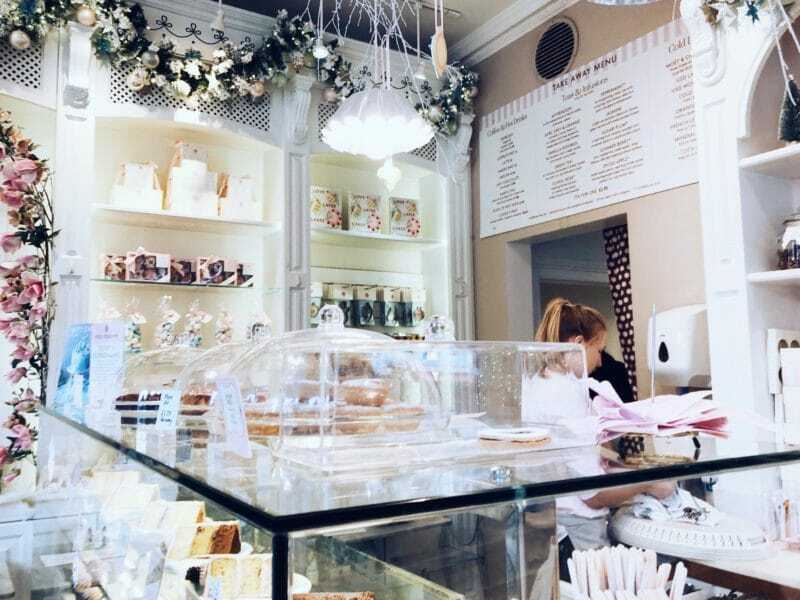 There were two girls on the table next to us frantically arranging their coffees and cakes for photos, and on the other side a reluctant looking boyfriend was snapping his girlfriend posing with her pastel coloured teapot and rainbow layer cake. The two girls draping themselves over the doorway were still snapping away too. The whole experience was hilarious, and a complete head turner. Everyone walking or driving past couldn’t help but stare, it’s definitely not a place for the shy. Our order arrived and I had very high hopes for the red velvet cupcake. 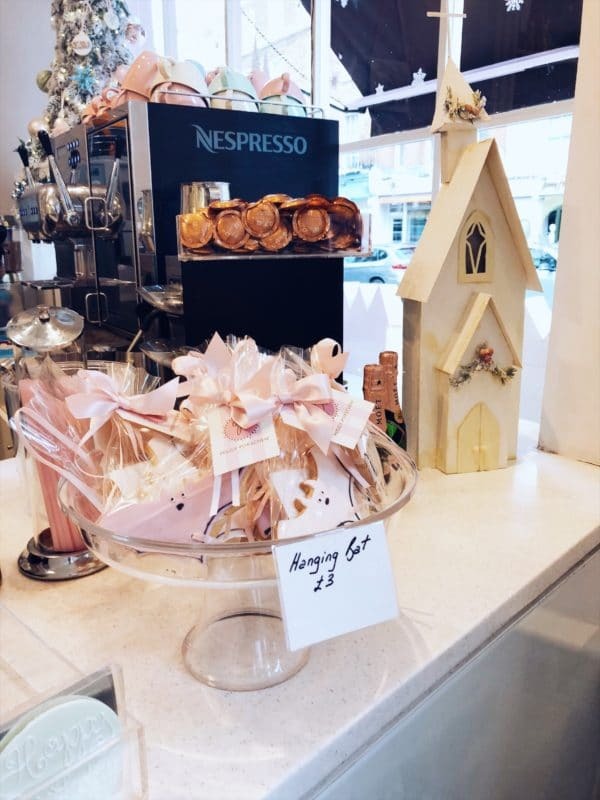 Peggy Porschen isn’t just a novelty cake shop or the perfect backdrop to model your latest Chanel handbag (seriously, thats what these two girls were doing). Founded by Peggy herself and her husband they have over fifteen years experience in making luxury, creative, edible works of art. They even opened London’s first ever cake academy, where you can study a full Professional Diploma program of baking, techniques and skills. Their client list includes the Royal Family, Elton John and Kate Moss. There was me thinking Mary Berry is the queen of cake! 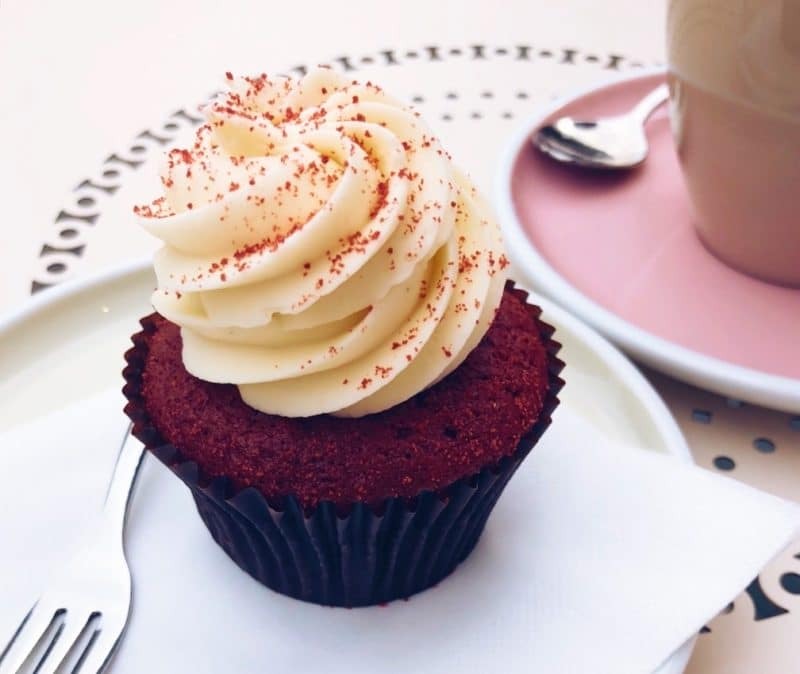 Normally one to pick up a cupcake and wolf it down, even I took my time and even used the dainty silver fork that came with it. It really was tremendous, and washed down with a hot, heart warming coffee it made for the perfect mid morning winter coffee break. Deciding I’d have to get a takeaway option for later I went back inside to pay, and was torn between the Christmas iced biscuits and the macaroons. I went for the macaroons, one of each colour and yes they were light, fluffy and full of flavour. 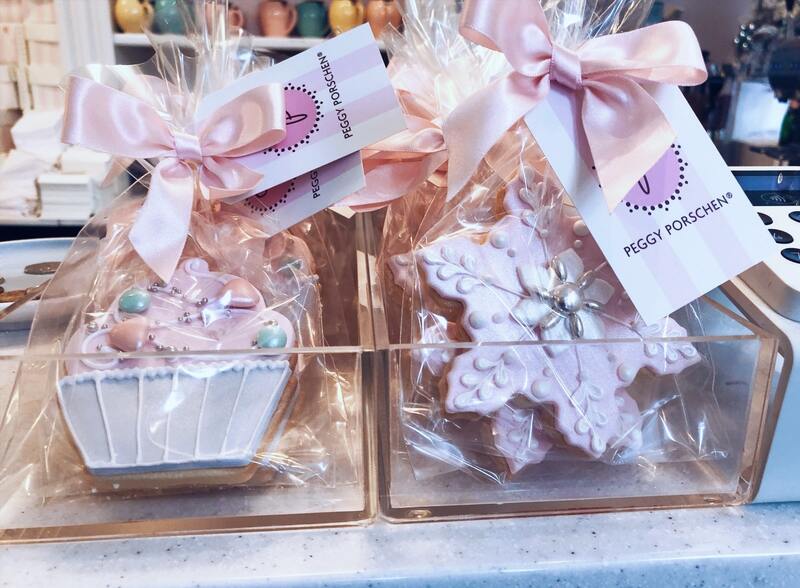 Overall I absolutely loved my short but very sweet Peggy Porschen experience. It was quite surreal, being surrounded by this completely pink world that drove everyone into a photographing frenzy – myself included, just no selfies. 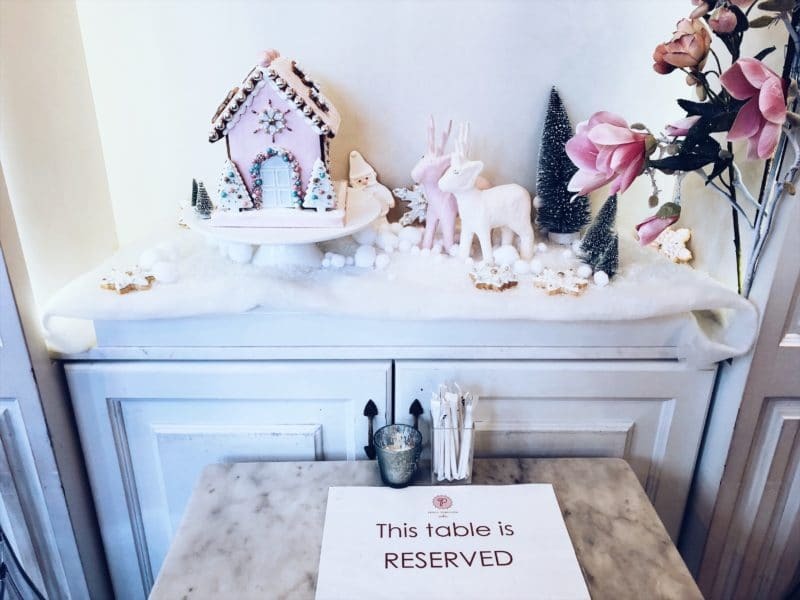 But taking away all the frosting and sprinkles, the cakes were incredible, the service was fast and friendly, and it leaves you walking away feeling all fuzzy and happy with a pink spring in your step. I’d highly recommend a visit! Ebury Street, Belgravia, London. Easily walkable from Sloane Square or Victoria tube stations. 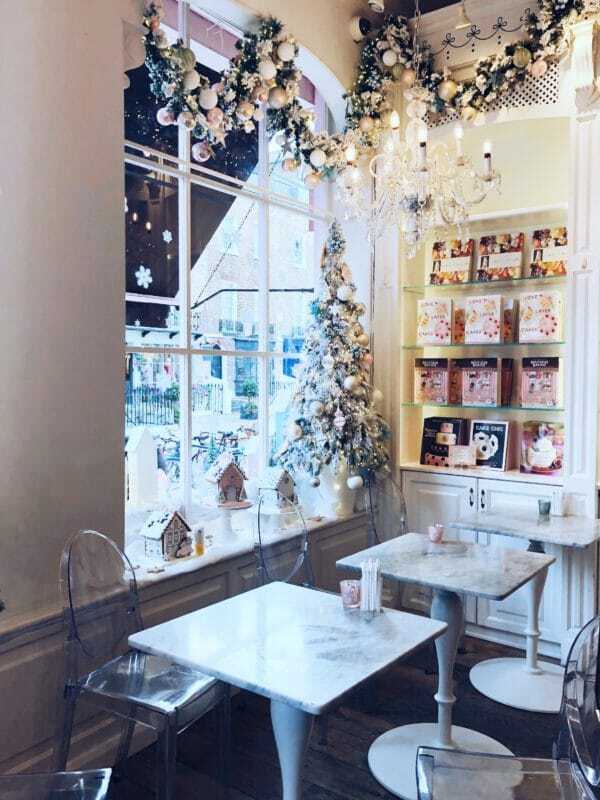 Definitely go if you’re going Christmas shopping near Sloane Street and Harrods! It is SO beautiful and I’m desperate to go! I haven’t been to London for over a year now but when I do plan a visit this is where I’m going to head! Thanks for the little look inside, I have seen so many instagram pictures of that doorway but never actually had a look at the interior! 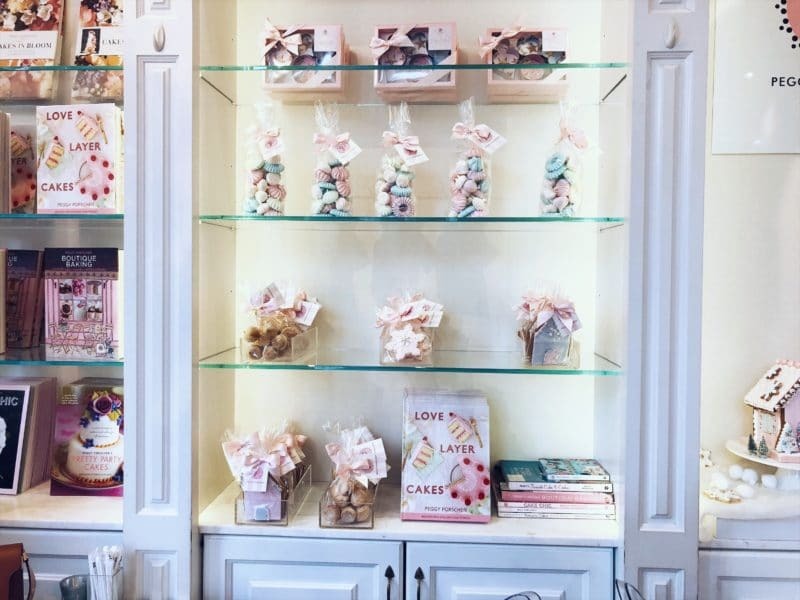 This is such a sweet shop! This is definitely the place to take some photos. Next time I’m in London, I’m definitely heading over!